A British economist, journalist and author, considered by some to have been one of the world's best forecasters when it came to economics and society. These forecasts mapped back to system designs mediated so that readers and entrepreneurial networks could exponentially calibrate shared alternative scenarios. He joined The Economist in 1949 and retired as its deputy chief editor in 1988. He foresaw the Pacific century, the reversal of nationalization of enterprises, the fall of the Berlin Wall and the spread of the internet, which were all published in the newspaper during his time there. Not to get bored, his first ten years in retirement produced the biography of Johnny Von Neumann (the mathematical father of computers and networks), a column for the UK Sunday Times, and a 'Heresy Column' for Fortune. 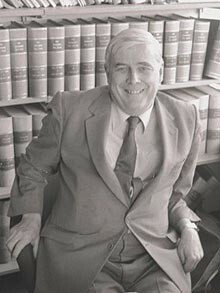 He was the father of mathematician, marketing commentator, and author Chris Macrae. Their joint future history on death of distance in 1984 forecast that 2005-2015 would be humanity's most critical decade irreversibly impacting sustainability. In 1984, he wrote "The 2024 Report: a future history of the next 40 years". It was the first book to: provide readers with a brainstorming journey of what people in an internetworking world might do, and predict that a new economy would emerge with revolutionary new productivity and social benefits enjoyed by all who interacted in a net-connected world. In this book, he wrote: "Eventually books, files, television programmes, computer information and telecommunications will merge. We'll have this portable object which is a television screen with first a typewriter, later a voice activator attached. Afterwards it will be miniaturised so that your personal access instrument can be carried in your buttonhole, but there will be these cheap terminals around everywhere, more widely than telephones of 1984." PC1 Was it a mistake for a book, whose main economic recommendation was that open education would be the net generation's greatest ever entrepreneurial freedom to start with valuing how to network peace? 1 the core job of the economists is to back whatever system designs she or he believes will help the human race unite to end poverty ( see the last Keynes last essay on persuasion); see also last 3 pages of Keynes general theory on why youth's greatest enemy is a particular type of elderly academic economist who is most prone to pad his pension with funding from big governments on industry sectors that have lost that purpose which has most relevance to producing future livelihoods.